Olympic record gold medal winner U.S. swimmer Michael Phelps adjusts his googles during his visit to the sport complex of the Alemao favela in Rio de Janeiro, Brazil on Oct. 30. 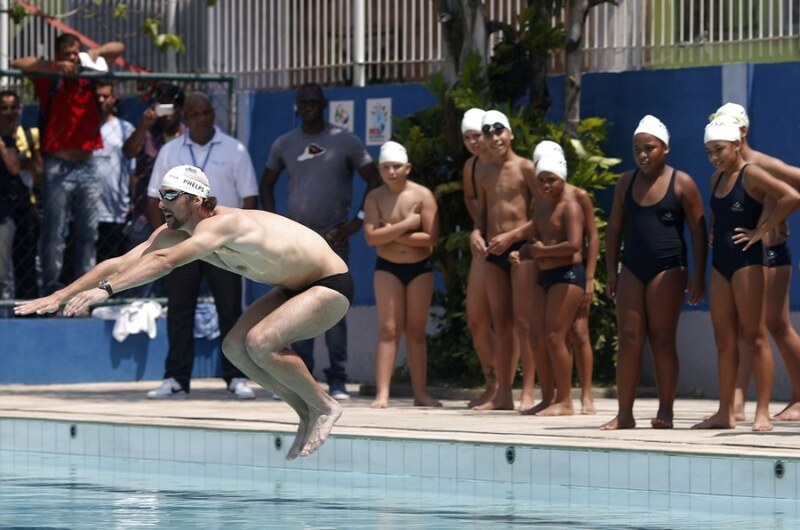 U.S. Olympic swimmer Michael Phelps gives a swimming lesson to youths during a visit at the Alemao slum complex's Olympic Village in Rio de Janeiro, Oct. 30. U.S. Olympic swimming champion Michael Phelps trains young swimmers at Olympic Village Carlos Castilho in the Complexo de Alemao slum in Rio de Janeiro, Brazil, Oct. 30. U.S. Olympic swimming champion Michael Phelps high fives young swimmers after leading them in a workshop at the Olympic Village Carlos Castilho in Complexo de Alemao slum in Rio de Janeiro, Brazil on Oct. 30. Micahel Phelps, the most decorated Olympian of all time, held a swimming workshop in the Clomplexo de Alemao slum of Rio de Janeiro today. He was visiting to Rio de Janeiro to promote the 2016 Olympic Games.